You'll never really know if you can rock it if you don't first try it on. That was the mentality of today's featured fashion individual, Gina. Her initial impression of overalls wasn't very positive, but she had witnessed other people wearing it and pulling it off incredibly well online. Although celebrities have been seen wearing overalls, Gina mentions that she'd never seen anybody else around her wear them. She adds that it's fine to dress like people around you, but it does't define who we are. Gina says that she loves to be a little bit different and enjoys putting a twist on the usual clothing she sees everyday. The answer to that today was a pair of denim overalls, which she more than absolutely pulled off. Although she may have contemplated the thoughts of others, she wanted to wear what made her happy, regardless of anybody else. Most importantly, it's our own clothes and body and in reality, the only opinion that'll matter is our own. Gina's outfit is a large statement. It takes a lot of courage to get out of your comfort zone, but it's all about confidence. If you don't go in believing you can pull it off, then you may not. The clothes in fashion are just as important as the confidence from the person wearing them. You can look good in anything you want to, you just have to set your mind to it. 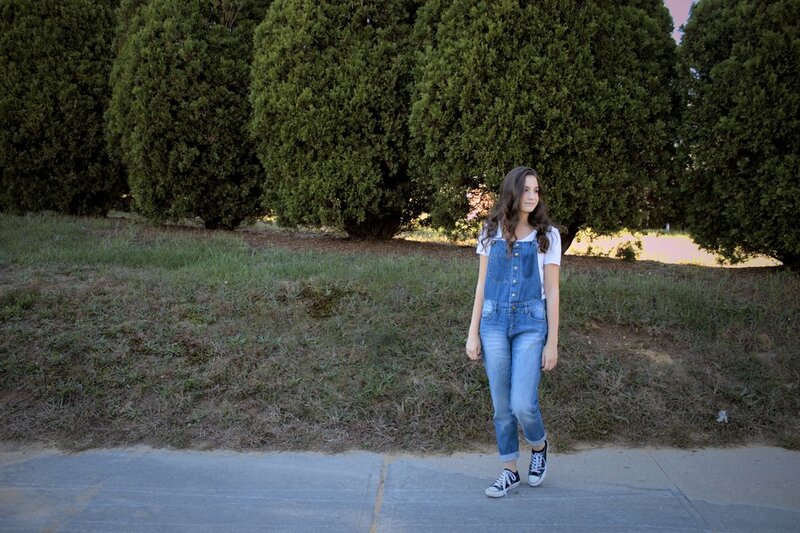 Onto today's outfit, Gina is wonderfully rocking a pair of button front denim overalls, the centerpiece of her apparel. She also has on a scoop neck white tee and a pair of classic black converse. What Gina added to her overalls is perfect. The tee and shoes are simple, which both compliments and enhances her overall look overall. All together, Gina has created a looked that really stands out and proves that we can rock anything we put our mind to!